I love music...a lot. I plan my life around it. It inspires me and stirs me. And plentiful live music is one thing I love about living in Julian. This weekend is no exception. In addition to our weekly Sunday 'Music at the Marketplace' we also have live music at many other locations in Julian including Wynola Pizza, Bailey's, Jeremy's on the Hill and the Pine Hills Lodge. The annual Dance at Menghini is also happening this Saturday. If you haven't been to The Dance--a festive family-friendly event-- I highly recommend it! So, as for Wynola Farms Marketplace goes, we are excited to feature the music of the Salty Creek Boys this Sunday at Noon. 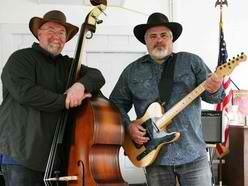 You can learn more about them at (http://www.reverbnation.com/thesaltycreekboys). Join us for BBQ, beer, wine, hard cider and some good old fashioned fun.